inking and green-minded companies are beginning to address the problem of waste in this important part of the supply and distribution chain. 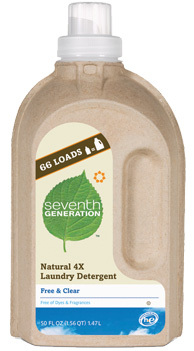 Seventh Generation is a company that’s taking a leadership role on this issue with the release of a new cardboard laundry detergent bottle. We’d like to introduce you to Ecologic Brands, the company-behind-the-company that is allowing Seventh Generation to make this shift. Listen to show host Bill Acevedo discuss the issue of product packaging with Ecologic Brands Founder and CEO Julie Corbett in the download of Episode 17 of The Wendel Forum(originally aired on Green 960 AM radio on May 28, 2011). They discuss the challenges of packaging, including sourcing of raw materials and opportunities for recycling post consumer use. The conversation turns to all aspects of packaging life cycle and who is really driving changes to this part of product manufacturing – consumers or companies? Be sure to listen all the way to the end to hear about the contest that Ecologic Brands is currently running! What are some of the best (or worst) examples of product packaging you’ve seen lately? Packaging does cause the most wastage and its thus imperative that a recycling system be functioning for it. Packaging creates a unique way of differences in each and every product and each one looks so beautiful in different kind of packaging. Sometimes it happens there are many of the products which are competitive but it can be competitive in a real sense if it has good packing criteria and also have a good handling via its care. Thanks for your comment. Do you believe consumers are influenced to purchase a product because the product’s packaging design speaks to their values (that is, if they are aware the packaging is made of more environmentally friendly material or less material than a competitor’s product)?